This summer the kids really enjoyed camping out in the backyard. We had campfires on the weekend weekends, and enjoyed cooking out over the fire. We've been working on creating a nice backyard recreational area, where we can loung around and hang out in the evening, have dinner outside and just enjoy the summer. 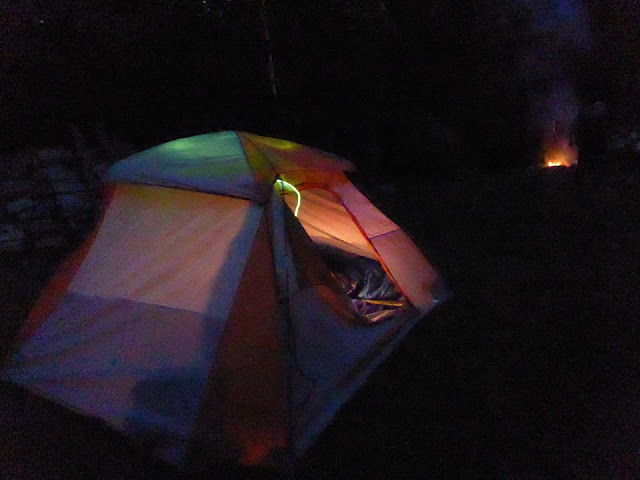 When the kids have friends over, they love getting out the tent and camping in the back yard. 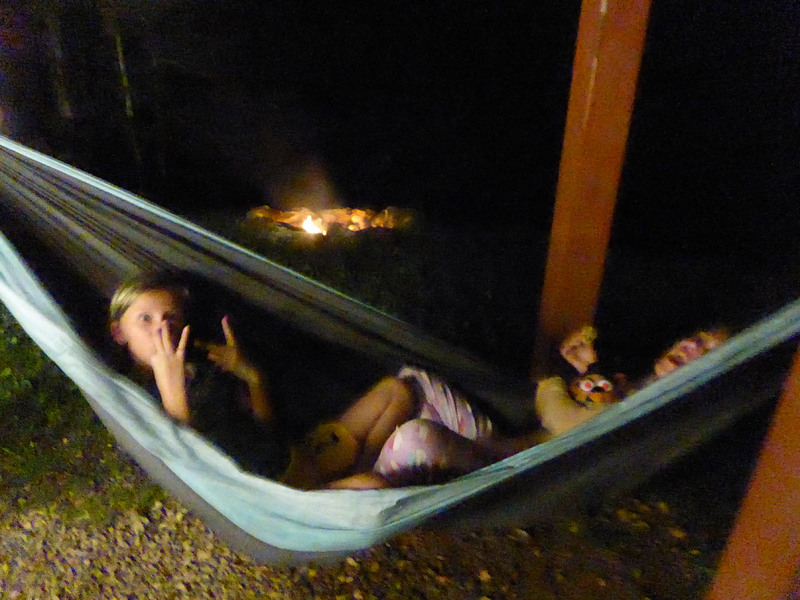 We make a camp fire, cook veggie dogs, and roast veggie packs in the fire pit. 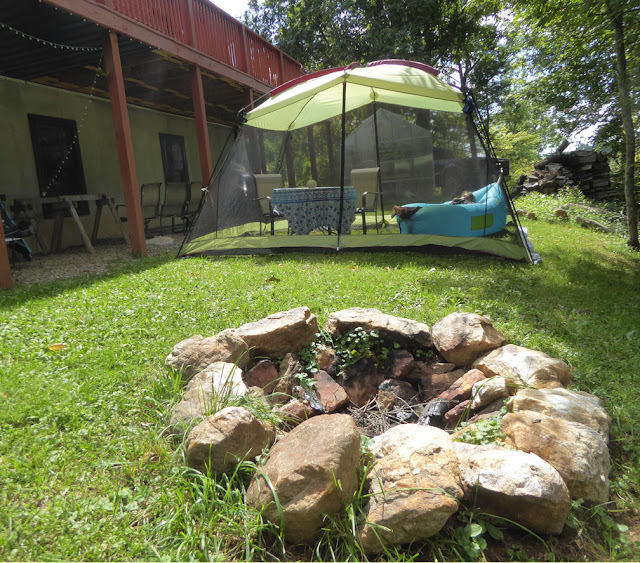 We also have our hammock set up under the deck, and solar lights above it to create an inviting atmosphere. Eventually we'd like to make this area a walk out patio with decorative stone, a built in fire pit and maybe a hot tub. :) We have a lot of plans for this area, but right now just enjoy it as our backyard camp spot. We have a small table and chairs under the deck where we put the food out, but because it's right on the edge of the woods the bugs are terrible and constantly try to get in the food. i end up having to keep everything covered. It's kind of a pain. So we recently got this screen tent by Roraima, to make cookouts far more enjoyable! 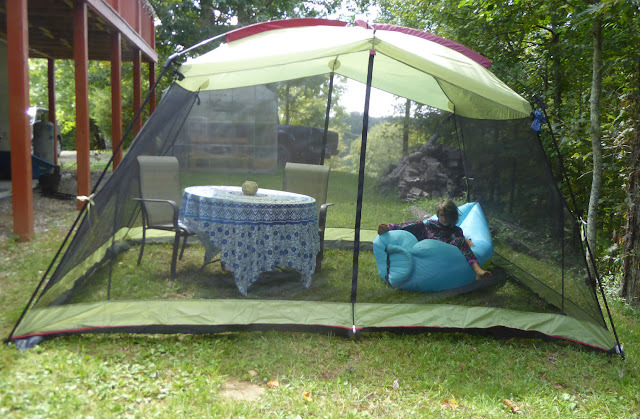 This bug proof screen tent is huge! It's 13 x 9 and around 7' tall. It has plenty of room to fit the table and chairs and an inflatable lounger inside! It's very spacious and incredibly easy to set up and take down. The entire screen tent and poles pack up into this small duffle bag, and it only weights around 20lbs. 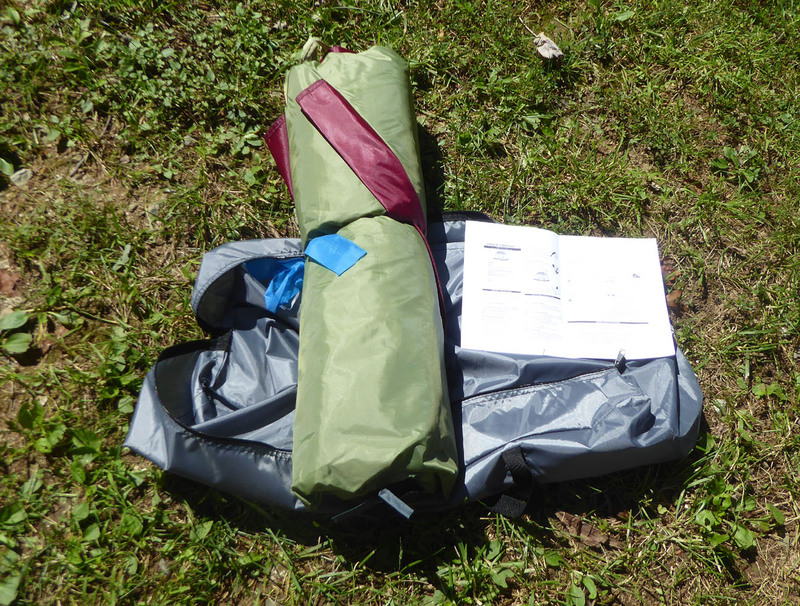 It's really manageable to take on picnics, camping or to festivals! It has stakes and ties to secure it down so the wind doesn't blow it over. The poles are made from fiberglass, so it's pretty sturdy. Setting up and taking down is really easy. You just unroll it and open it up so that the top of the screen tent faces up. There are three poles that fit into the top, and then 4 legs poles. 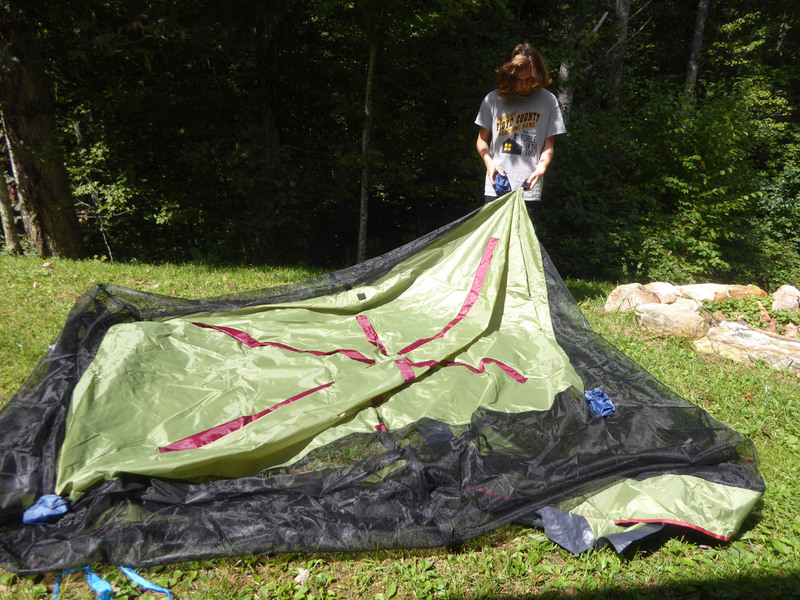 Sets up similar to a tent, but honestly much easier. It was really straight forward. 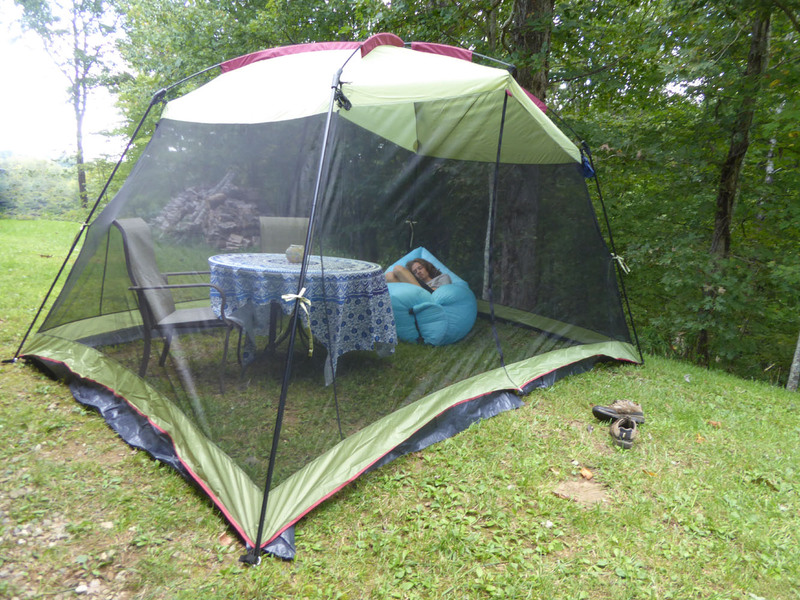 The screen tent has a zippered door on the front and back, and a hook for hanging a camping light. There are also attached tie strings if you want to tie the doors open. We've really been enjoying our summer of backyard camping, hiking, kayaking and cooking out. i'm really bummed that summer is winding down, and the kids are back at school. The temperatures have really been cool for September, but i'm hoping for another Indian summer so we can camp and cookout a few more times before the winter comes. i received the Roraima screen house for free or heavily discounted in exchange for my honest review, all opinions are my own. This screen house is available on amazon http://www.amazon.com/gp/product/B0732V1WRX It's currently 20% off and free shipping if you have prime. 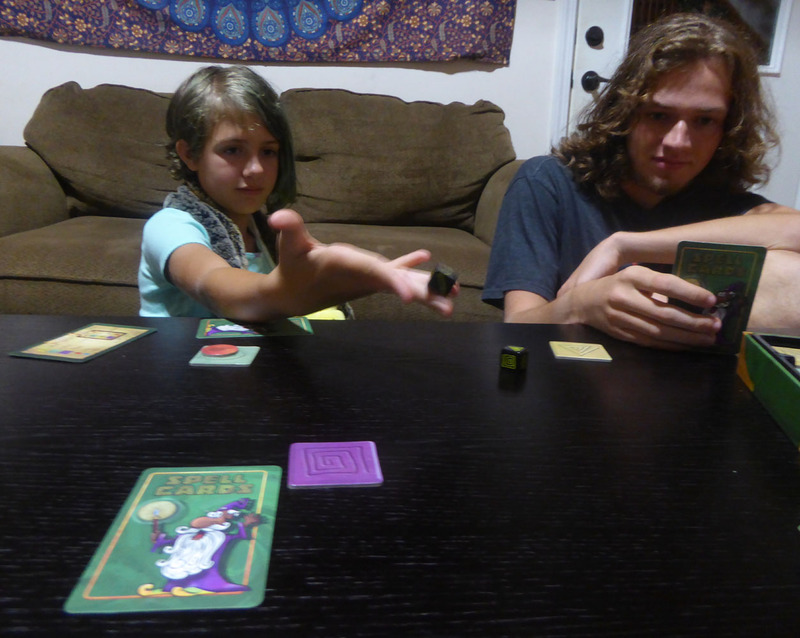 This weekend we tried out a new game for family game night! 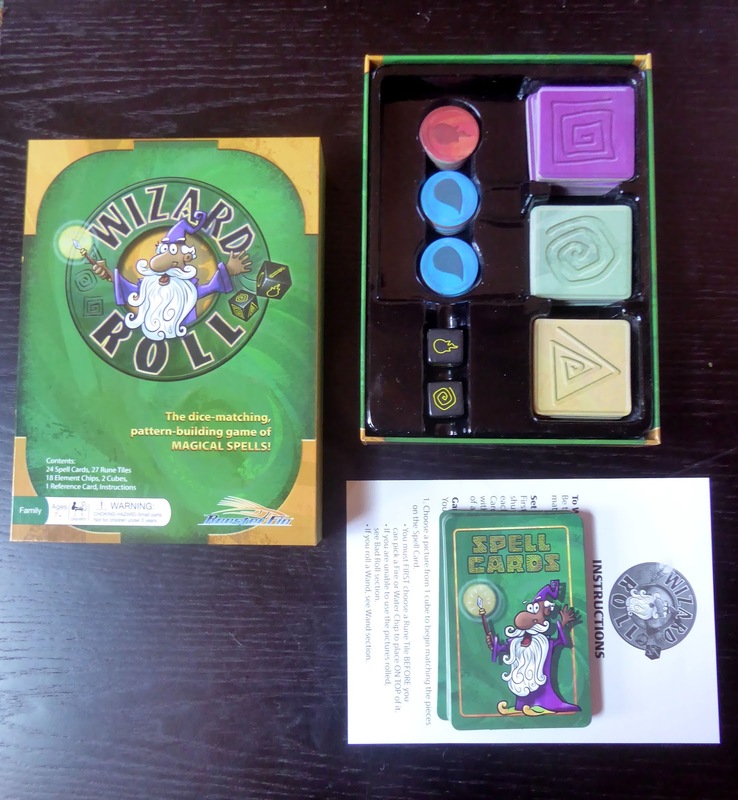 The game is called Wizard Roll and it's a dice-matching pattern-building game of magical spells! 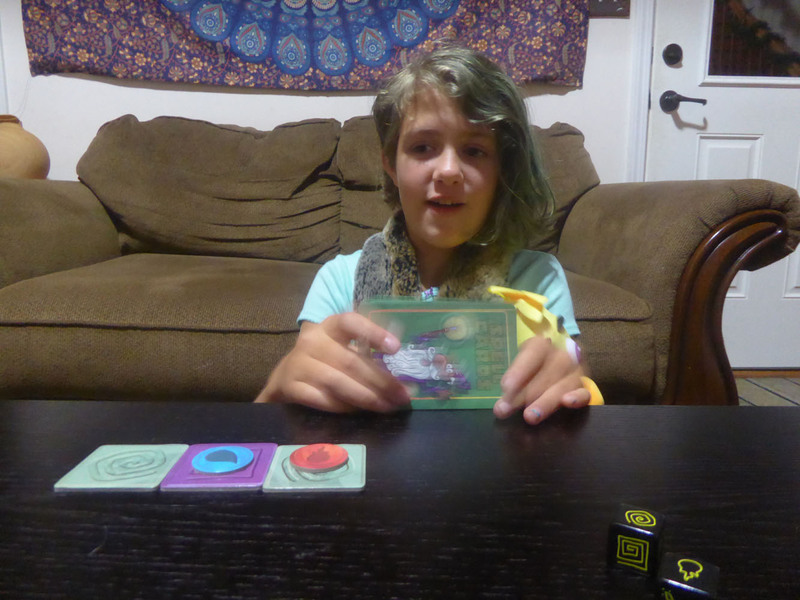 We love board games and all things magical themed, so i knew this game would be a huge hit! Wizard Roll is an award winning game Created by RoosterFin games. 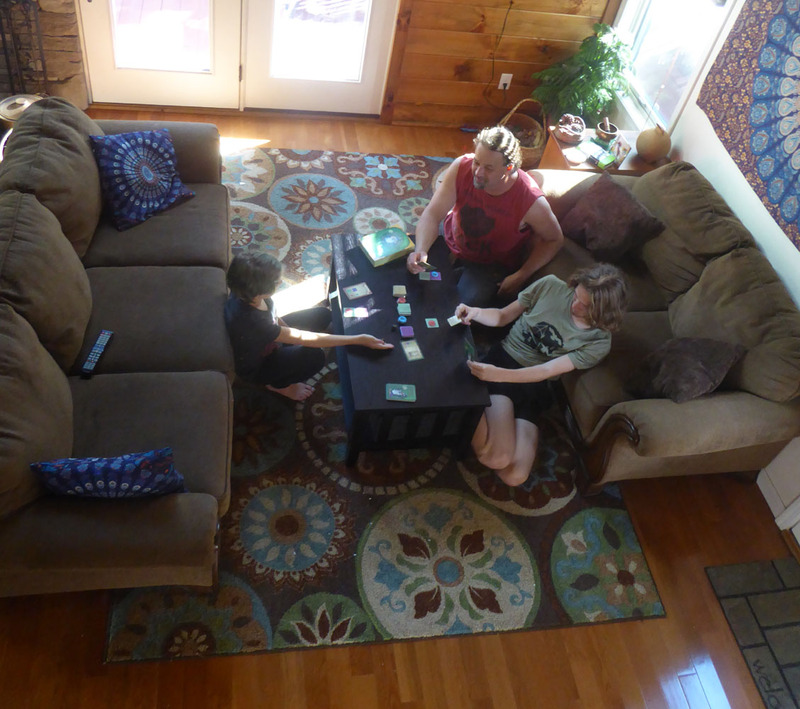 Roosterfin strives to combine the fun of board games with the joy of learning. They makes games that are perfect for everyone, no matter if you are 6 or 60! Wizard Roll is perfect for all ages; from kids and teens, to college students, parents, and grandparents! Founded by Joe RoosterFin, a former teacher with a degree in mathematics, these award-winning games are easy to learn, educational, and fun for the whole family! 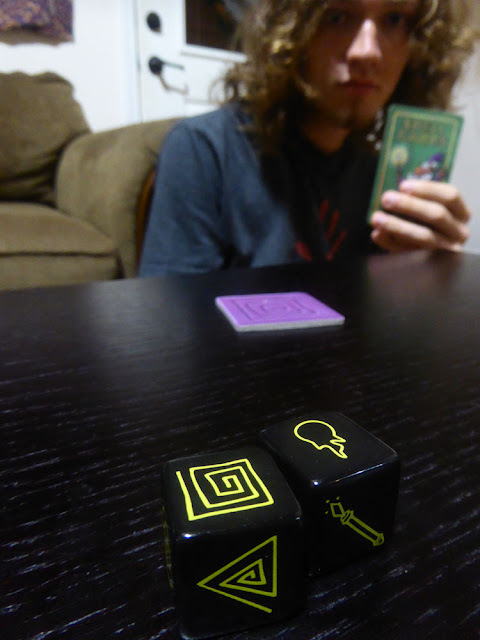 Players compete to help the Wizard complete his spells by rolling the cubes and matching the rune pattern on their Spell Card. Wizard Roll improves strategic skills and memory. The concept of the game is simple enough, and at first the game seemed a little too easy...however, if you roll the magic wand on the dice you can choose to 'zap' your opponent so they have to put one of their rune tiles back. Making winning a little more challenging than first expected. Once you complete your spell, you use the key card to say your spell. We had a lot of fun with it! Every time someone got really close to winning, they'd get zapped and have to put back a tile. My girl who isn't a huge fan of board games gave it an 11 (on a scale to 1 to 10) and was begging to play just one more game before bed. Wizard Roll received the 2017 Preferred choice award by Creative Child Magazine. It's fast paced and easy to learn. Recommended age is 7 and up, but younger players could easily play with a little assistance. We had a great time playing it and zapping our opponent tiles back to the pile. You can find out more info about Roosterfin Games on their website www.RoosterFin.com. i received the game Wizard Roll in exchange for my honest review. My opinions are my own. Only a days behind. i started the post at the end of August anyway. Here are a few pictures from last month. Mid August and tomatoes really coming in. Starting to get a few from all the different varieties i planted. Still getting lots of beans and cucumbers, getting a few squash as well. 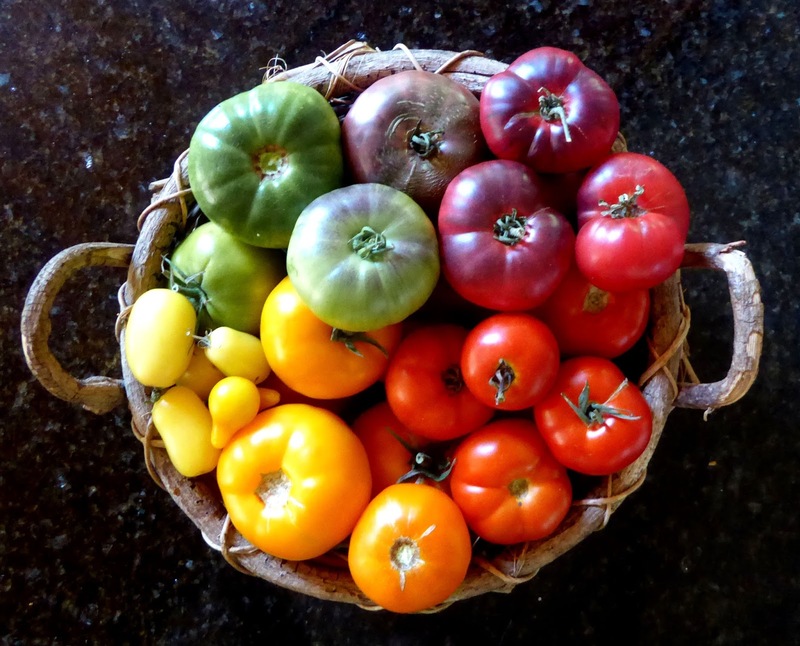 Rainbow tomatoes make me happy. 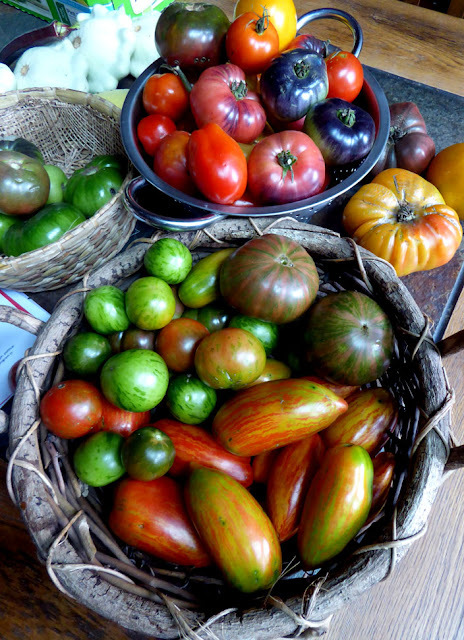 These are Early girl, Yoder's German yellow, Golden Jubilee, Cream Sausage, Yellow pear, Blue Beauty and Black Krim. August 26. Still getting peaches! Peppers are starting to ripen, getting lots of tomatoes and beans. Late season blueberries which i'd forgotten about are starting to ripen. August 29- My striped tomatoes which had been taking their time and finally starting to ripen. These are Berkley's Tie Dye, Striped Roman, Casidy's Folly, Tigerella, and Violet Jasper. Most of these are new varieties for me, although i've planted the Tigerella and Violet Jasper before. i tried growing the Striped Roman last year, but they never did much. The Tigerella have done really well this year. The plants are totally loaded, however, they are not split resistant. After we had a drought the first half of the summer, then it finally rained, every single tomato on the plant not only split but basically exploded. The plant is loaded again, and so far they seem to be doing well. If we get a heavy rain again though, i'll need to pick them quickly. My cold/storage pantry is really starting to fill up. 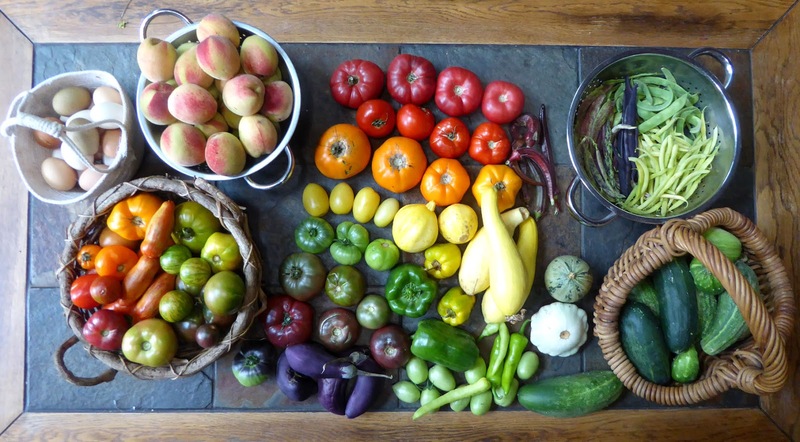 We've since dug more potatoes, and added several dozen cans of tomatoes and peaches. It's looking good for end of August, into September. i haven't dug sweet potatoes or harvested winter squash yet and i'm still canning. i was just gifted apples, and i have a second planting of beans coming in. It feels amazing to see all the food i've been able to grow and put up for my family. 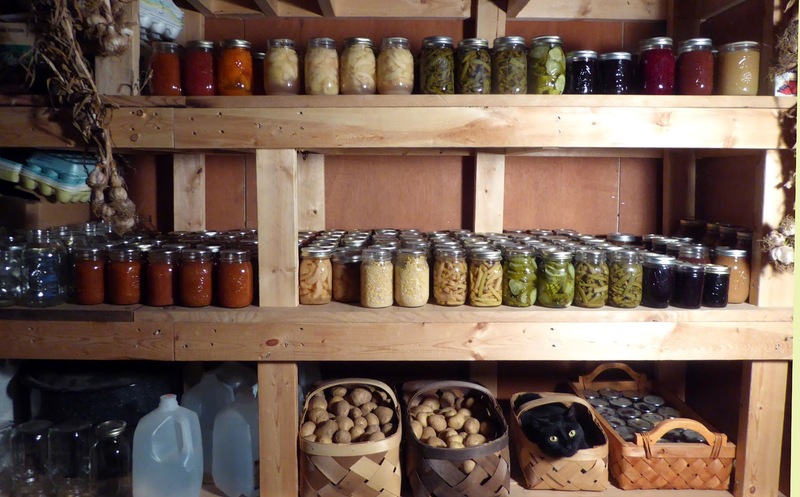 The whole state of the world right now has me a little anxious, i'm feeling a bit like a homesteader turned prepper. This past week, i've been filling the deep freezer and will get back to canning soon. 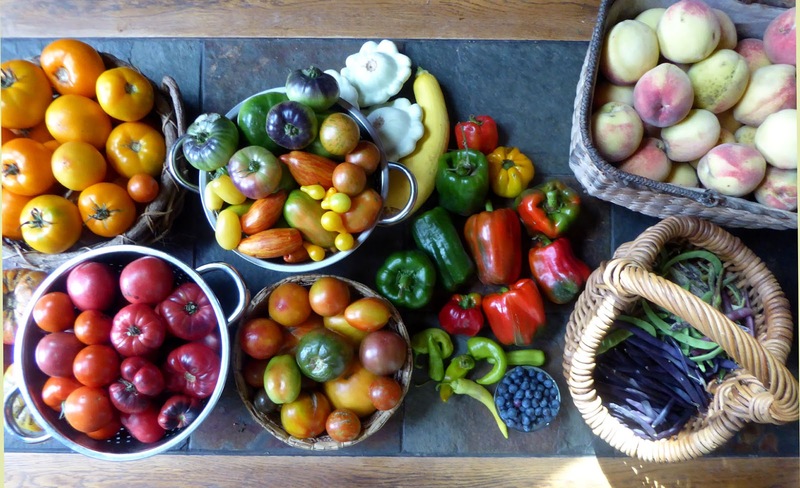 i also have a fall garden planted, and hope to continue harvesting up until the first frost. 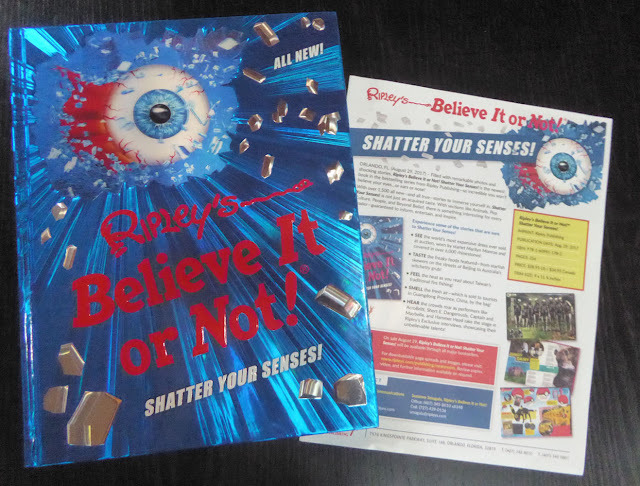 Ripley's Believe it or Not- Shatter Your Senses! All true, 100% ALL NEW, Ripley’s Believe It or Not!® Shatter Your Senses! will amaze and astound readers from the first to the last page. Hair-raising photographs, incredible stories, and the mind-blowing facts Ripley’s is famous for promise hours of entertainment for every Ripley fan! With thousands of stories—including submissions from readers around the world—you’ll discover something new each time you read it! If your kids are anything like mine, then the recently released Ripley's Believe It or Not! Shatter your Senses! 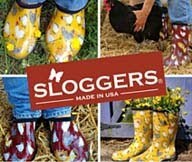 would make the perfect gift! 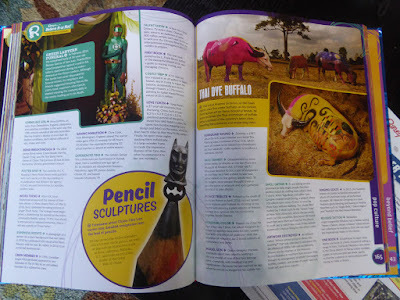 There are around 250, full color pages of weird and interesting facts! Both of my kids can spend hours reading the Ripley's books. My son will memorize the weird facts and then randomly share them when we are in the car. His brain is like an encyclopedia of weird facts and trivia. :) He really loves this stuff. Ripley Publishing has been releasing an annual book showcasing the weirdest and strangest facts from around the world along with hundreds of colorful photos. Shatter your Senses! is the 2018 edition of the bestselling annual series by Ripley’s Believe It or Not! There’s no way to prepare yourself for this all-true, all-new collection filled with incredible facts, unbelievable stories, and mind-blowing photography. A sensory overload, Shatter Your Senses! is sure to amaze and astound children and adults alike. Some of the photos are a little gross/gory so the recommended age is 10 and up. The eye ball on the front cover look 3-D and pop right off the page. It's really a fun book! Ripley's Believe It or Not! 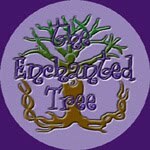 is globally renowned as the authority on the weird, the eccentric, and the amazing. Ripley's Believe It or Not! provides entertaining book which educates in a humorous style. The Ripley brand is known around the world as a trend-setting source of family-friendly fun and excitement! Every day the researchers at Ripley's are busy digging up the craziest true stories and the most unbelievable facts. This large hardcover, full color book retails for $28.95 and is currently onsale for $19.99. It can be purchased at Ripleys.com, Amazon and all major bookstores. *i did receive this book at no cost in exchange for my honest and unbiased review. i only recommend products that we truly love and would use ourselves. 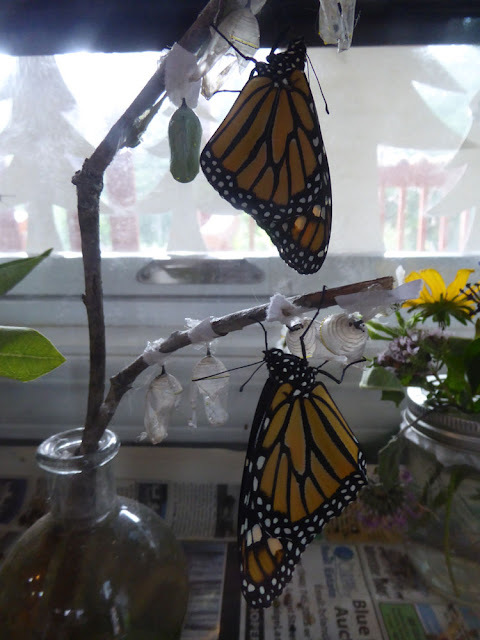 If you've followed my blog at all, you know that every summer, we gather all the Monarch eggs and caterpillars off the milkweed that grows along our road to raise inside. We do this for several reasons. Monarchs are considered endangered because of loss of habitat. Our county mows all the weeds on the edge of the roads to help with viability, but they often take down a lot of milkweed in the process. So we gather the eggs and caterpillars off of the milkweed, before the mowers come through. In the wild, statistics show that only one out of every 10 eggs survives to maturity. By raising them inside, i've had a 85-90% survival rate. Almost ever year i lose one or two to parasitic wasps, which infect the caterpillars before i've collected them. Occasionally the caterpillars will cannibalize other monarch eggs if they come across them on the leaves, and i've lost a few to different monarch diseases. However, compared to a 10% survival rate of those in the wild, i'm okay with an occasional loss. Raising monarchs is not difficult at all. You just have to have a good source of milkweed to feed them. You want to look for fresh green disease and pest free milkweed leaves. 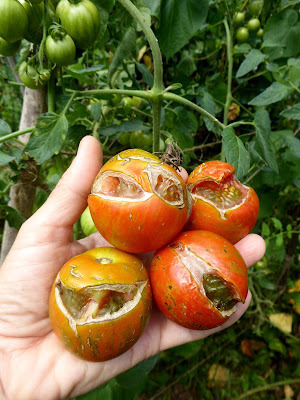 Always wash both sides of the leaves before giving them to the caterpillars, to wash away possible fungal disease spores. i keep my caterpillars in a 10 gallon glass aquarium. Placing the milkweed in a small vase of water to keep it fresh. The caterillars only leave the milkweed when it is time to shed their skin or pupate. They will move to the top of the aquarium to create their chrysalis, so you need to make sure they can not escape through the holes in the wire mesh top. My cats like to sit on top of the aquarium, and the silk holding my chrysalis to the top because loose. So i moved them to a branch instead. 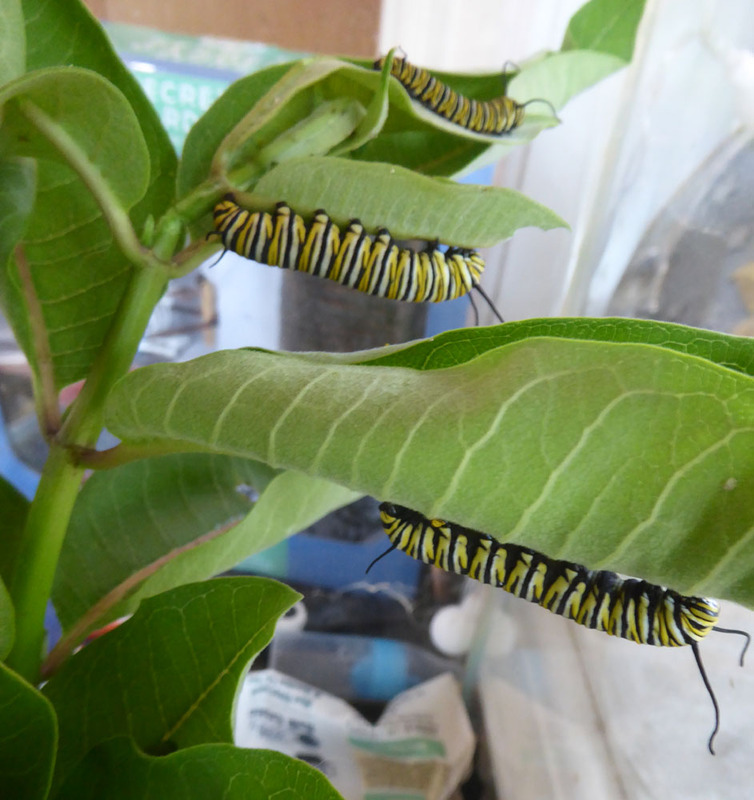 It also is a good idea to move them if you have to continuously open to the top to add more milkweed. 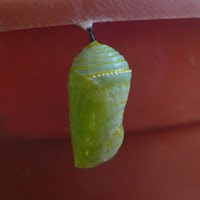 The chrysalis can be moved buy getle tugging on the silk that attaches it to the top. Then i use hot glue to glue the silk to a tiny square of paper. Then hot glue the paper to the twig. Be careful not to get the hot glue on the cremaster (black part above chrysalis) or the actual chrysalis. 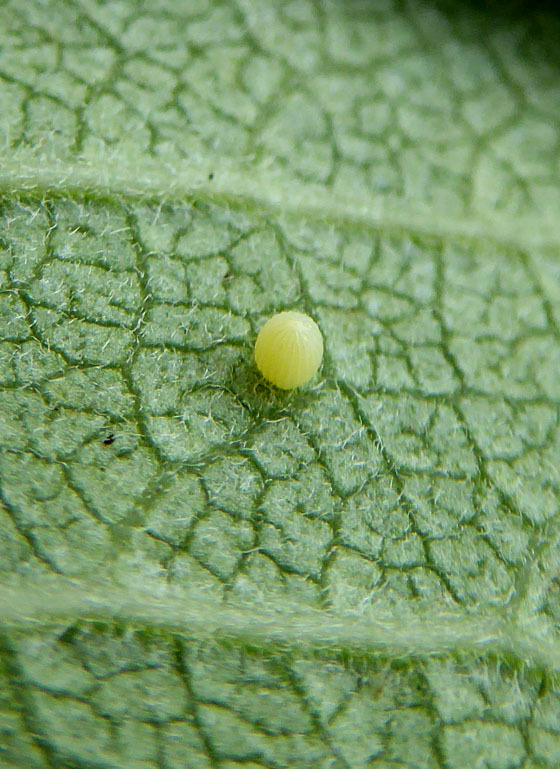 This photo shows the silk used to attach the chrysalis to the top. As you can see,just by the weight of the butterfly, It's quite easy to pull it off with out damaging the chrysalis. 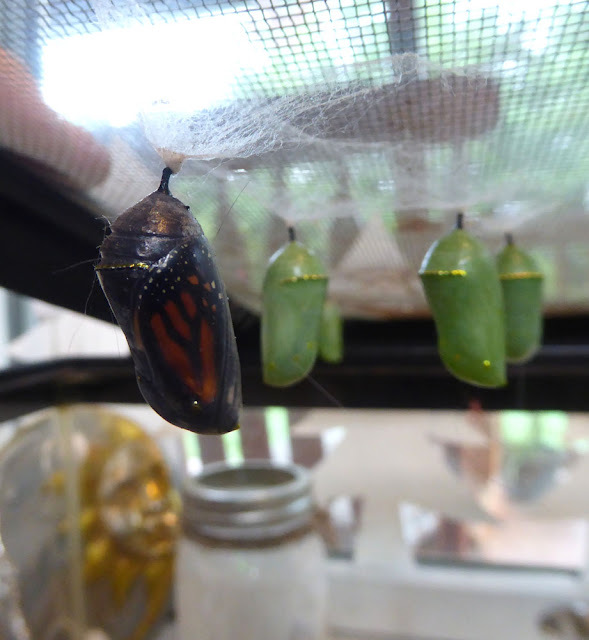 When the butterfly first emerges is wings are crumpled and it's body is swollen and filled with fluid. 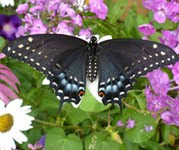 The butterfly pumps the fluid from it's abdomen into it's wings to unfurl them. 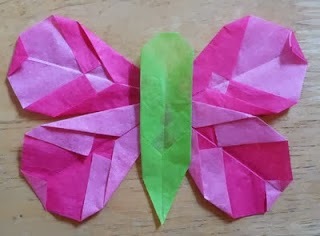 Once the wings are open and the new butterfly will sits for several hours until the wings are dry. Drying time depends a bit on the weather. On rainy or humid days it takes longer for the wings to dry. So far we have released 6 butterflies, and i have 8 chrysalis and one more caterpillar still munching. 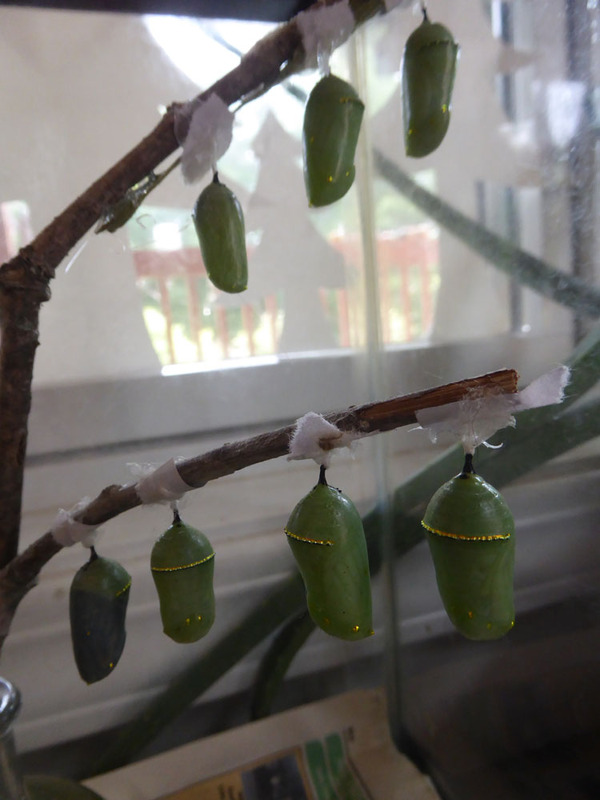 Raising caterpillars is easy to do and fun for the whole family. We all love releasing the butterflies and watching them fly away and sometimes return to the flower garden a day or so later. 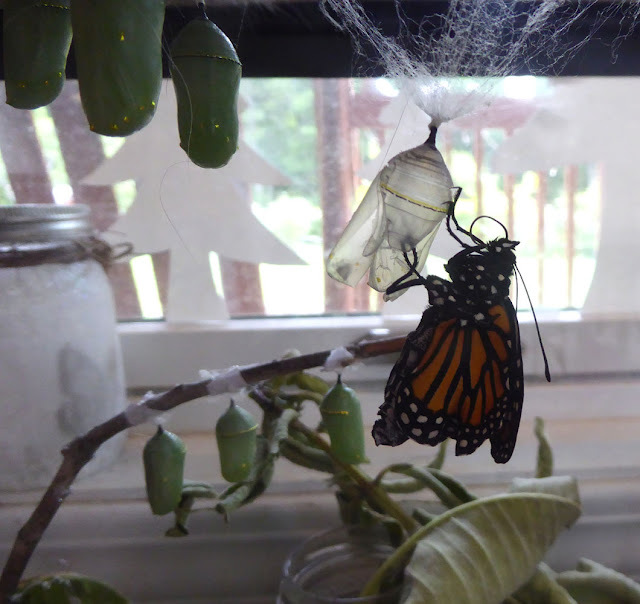 Raising monarchs is something we look forward to every year, and even if they were not endangered, i know we would continue to do it. Ever year i plant more and more flowers for the butterflies and am still working to establish a large patch of milkweed that is just for the monarchs. 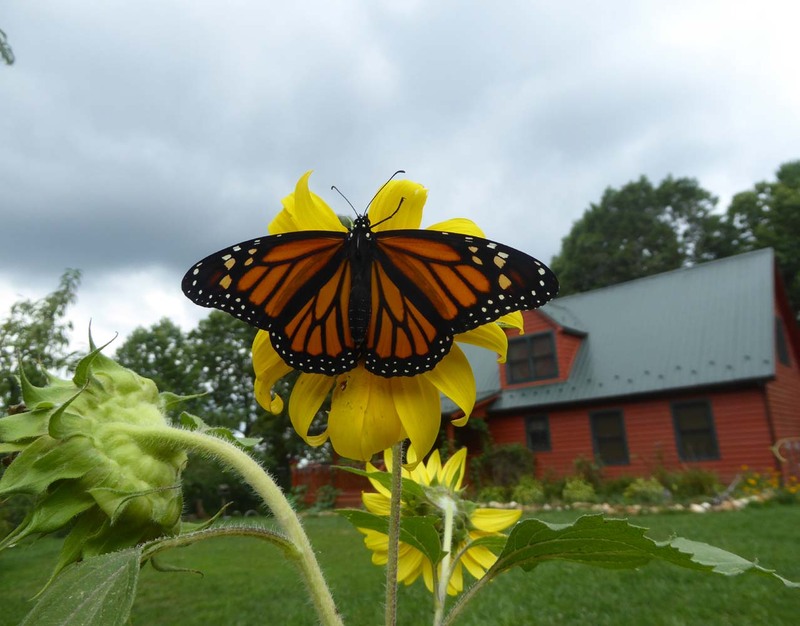 i like to believe that although i can not save all the monarchs from the county mowers, disease, parasites and destruction of habitat, i can still make a difference to a few.